Amazon Filters SupaPore FPW microfiltration cartridges from have been widely proven as highly efficient membrane pre-filters by leading wine producers and bottlers. Wine making is a combination of modern technology and traditional craft. The control or removal of contaminants such as bacteria, crystals, particles, treatment residue and yeast is critical to ensure the taste and shelf-life of the wine. 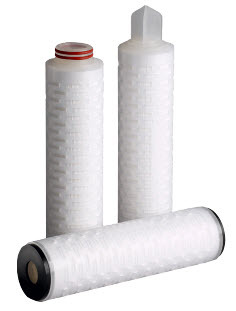 Manufactured from highest quality filter materials, contained within a robust polypropylene assembly, SupaPore FPW filters are designed to meet the high and exacting standards seen in modern wineries. The optimised multi-layered pleated depth media in SupaPore FPW filters offers high flow rates, excellent dirt holding capacity and superior retention levels making them an ideal clarifier for wine, in particular for pre-filtration. Reduction in contamination concentrations in wines are calculated using log reduction values (LVR). Different grades of SupaPore FPW filters with validated LVR are available to ensure the user of optimum protection for both their process and the final product.